At any given time in the garden, seeds are germinating at an alarming rate, but how to choose between those you want and those you despise? 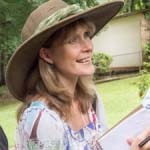 Experience informs much of the decision making process when one is down on one’s knees, trowel in hand – but it would be fibbing to maintain that experienced gardeners can identify the first true leaves (much less the cotyledons) of all garden weeds. What’s more, these sneaky greens often put themselves right where you seeded something exotic last autumn; forcing you to order a stay of execution due to lack of evidence. Thumbing through Garden Flowers from Seeds by Graham Rice and the late Christopher Lloyd, I was happy to see that these two horny handed sons of the soil had just as much difficulty as the rest of us plebs trying to distinguish weed from wanted. Rice advocates sowing in rows and exterminating all seedlings deviating from the straight and narrow; Lloyd felt that broadcasting seeds thickly worked much better – working under the principle that there will be more of the wanted than the weed. I tend to agree with my idol. Straight rows of anything besides vegetables rarely work in a cottage garden setting, so the seedlings will eventually need to be transplanted (read: more work). 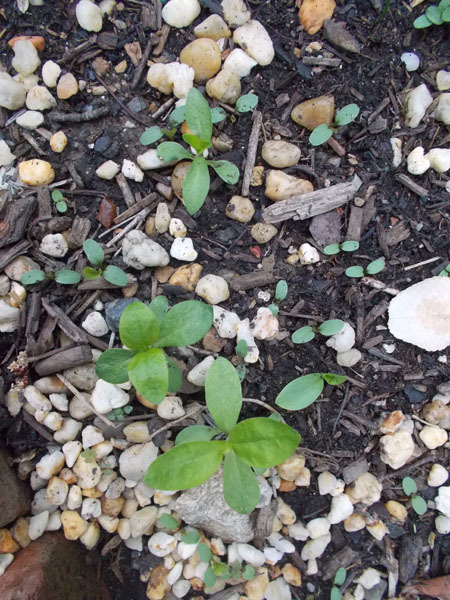 A large amount of anything germinating at the same time is easy to identify, and providing you have marked your spot with a stick (and your terrier has not used that stick as a convenient chew toy), you have a pretty good chance of keeping the right seedlings. Phlox seedlings interspersed with dead nettle insurgents. Of course, there is the question of “what is the right seedling?” In the above case, it’s whatever you bothered to shake out of a seed packet when normal people were thinking how cold it is outside. But Mother Nature has a unique sense of style and other plans for your garden, and it is always worth looking to see what she may have in mind. 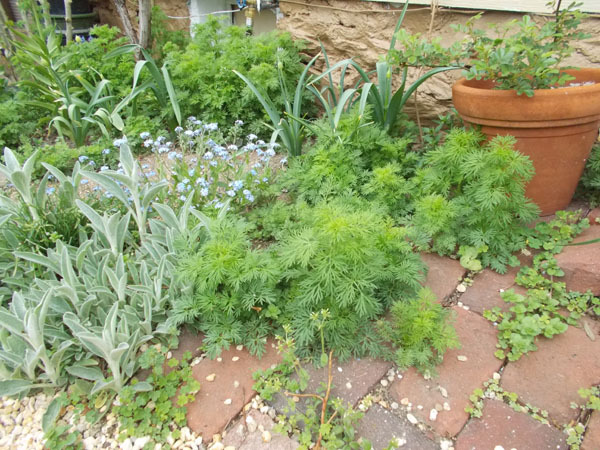 Annual flowers such as nigella, larkspur, poppy, lunaria, hesperis, zinnia, cosmos and marigold are rampant self-seeders (though the poppy needs a bit of a push ’round here). Once you have a good idea of what the underage version looks like and can edit appropriately, you may be delighted by the variety of flowers that you didn’t plant, not to mention the out of the ordinary places you didn’t plant them. Self-seeded volunteers are some of the hardiest little seedlings around, and almost always seem healthier than those you intended to plant – most probably because they germinated in just the right conditions…which are not necessarily yours. Too much of a good thing is to be avoided. 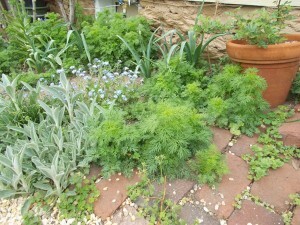 Although a few poppies are fabulous, fifty poppies in a clump are going to fail. Whether it was your idea or Mother Nature’s to be profligate in spreading seed, see that you quickly use those editing fingers to give seedlings the best in the way of spacing, water and light. Without quick action you will end up with a whole mess of stunted, spindly plants with not a respectable bloom between them. As for the unwanted seedling? The miserable plant with nothing more to recommend it than its remarkable powers of reproduction? Get to know your space. You’ll soon get to know your own weeds, even if you don’t know their names. Right now I am battling bittercress and chickweed, but a friend near the river fights ground sorrel and garlic mustard. And if you are stumped by a mystery seedling, no harm will come from letting it grow for a few days. Not only will it clear up any identification errors, it will also give you something tangible to grasp when you pull it out by its wicked little roots. I sprinkled the seeds in the same cinder blocks I used as ‘containers’ for the Nasturtium “Moonlight” seeds I grew last year. Hopefully there weren’t any self-sown seeds in them from last year. The “Moonlight” seeds I also got from Renee’s Garden and it was my experience growing them last season that prompted the seed GROW project idea. I blogged about how the seeds didn’t do much after germinating and there wasn’t any climbing occurring and how it wasn’t until right after I complained to Renee about the seeds that they started growing like gangbusters. It was my experience growing them that got me wondering about the experience of other gardeners who bought the same seeds and how the seed GROW project came to be. Nasturtiums have been a favorite annual of mine because they are relatively inexpensive, easy to start from seed, flower more in poor soil and provide me blooms right up to, and sometimes after, the first frost of the season when everything else in the garden is starting to go dormant. The leaves, flowers and seeds are edible and decorative and I recommend them for every sized garden. Update 5/17: While walking around the garden today I noticed that both the Nasturtium seeds I scarified and the seeds I just planted without pre-soaking them had both sprouted. I would’ve expected the seeds that were scarified to germinate first, but I think the wet weather we had after I sowed the seeds in the garden helped the untreated seeds catch up with the scarified and pre-soaked seeds.